Before me flows a river bathed in sunshine. Its size dwarfs any I’ve cast a fly in. Swollen currents toil a tainted brown from days of relentless rain. A condition that occurs with more frequency from years of clear cutting that now jeopardizes the heath of all waters in this province. 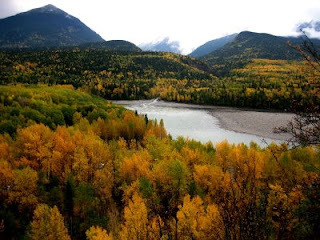 A slim buffer of vibrant cottonwood, birch and popular radiate in fall color; accentuating the virile condition of the river. The immense landscapes towering snow capped peaks and unimpeded waters are impressionable. Hidden amongst these murky waters migrates the majority of this regions wild steelhead, the names of their home waters legendary in steelhead lore. Given its current state it’s difficult to imagine these piscatorial travelers are present, yet these conditions will do little to deter a primordial instinct. Little does. Two decades of fishing in British Columbia has yet to afford me time on this intimidating river since I first stood on her banks. 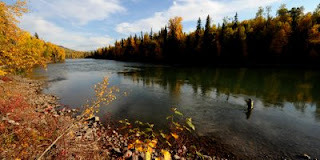 Many of its famed tributaries have seen my foot prints, but never the Mother River. The last time I saw her was over a decade ago where several of her tributaries open to accept her offerings. Not far from that point of observation stands a row of native long houses and totems, a tribute to the Gitxsan People, and the spiritual powers this confluence holds. After lodge life this year, an old friend invited me to poach some of the British Columbia’s other waters. After goodbyes were exchanged with our hosts and my fellow companions, Collin Schadrech and I headed north on Yellowhead Highway. Gray skies clouded the landscape dropping a steady drizzle on the windshield and surrounding countryside. A perfect day for steelheading accompanied us to our new digs. Our base for the next few evenings was a stark contrast from that which I had enjoyed over the past week; cinderblock walls, well worn shag carpets, moldy towels and meals prepared over the tailgate of Collin’s Chevy. No plates, no dishes. From our front door, Stekeotin loomed ominously overhead. Steelhead paradise never looked so good. That afternoon we spent the bulk a wet day slogging through marshes, deadfall and the provinces dense brush in search of legends and myths. Maps were of some help, but much had changed since they were drafted. We often paid for their inaccuracies. Before darkness ended we pioneered a handful dirt roads, this time along the Mother River. In the waning light we searched for a descriptive boulder with a single cairn perched upon its top. We were unsuccessful. By the time we left the valley’s river bottom it was raining and dark, a darkness that’s difficult to find these days. In remote corners of the world removed from global sprawl you’ll witness such blackness. On this evening a low ceiling hid heavens light show intensifying the abyss. The following day we arose early, beginning our day in darkness. By the time we headed out, morning’s sun still had yet to crest the snowcapped peaks that kissed a thin layer of residual vapor. Eventually we located the road that eluded us the evening before. The old track wound through long abandon fields, dull in dying weeds and tall grasses. We parked a short distance from the river. Its banks lined in ancient popular, cottonwood, birch, and balsam fir. Below us the waters strolled leisurely for hundreds of yards among sizeable boulders. 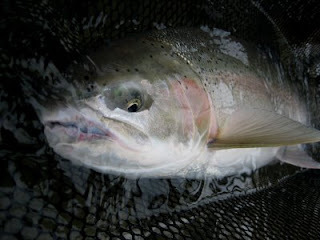 It shimmered, as only a steelhead run can. Towards the head of the run stood the rock with an unobtrusive cairn perched nonchalantly upon its surface. Our eyes lay fixed on the water, making mental notes as to where each fish may lie. As we drifted apart, the old man chose the head of the run, while I stepped in midway. The rivers size yearned for long casts. I thought the same to hold true for the fly; big river, big fish, big fly. Yet I refrained, at least in first passing knowing that this was our water to fish alone. Dec Hogan’s words resonated through my fly box as I selected a pattern. 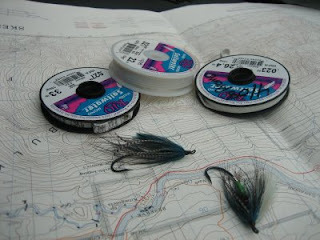 Eventually I chose a preferred spey fly in hopes of taking my first fish on one worthy of these fish and the occasion. About a quarter of the way into the run I had to calm myself. I had plenty of coffee this morning. I usually do, but that wasn’t the reason for my anxiousness. I started thinking of the famous tributaries that feed this big body of water, their names rolled through my mind along with the significance of their steelhead. A broad grin crossed my face as I scanned the snowcapped peaks that overshadowed the valley. Finally stepping back into the river, I knew they were there. Each swing of the fly I expect a tug. In disbelief the governors removed from my cast. I tack on another ten feet or more. Several casts later a fish boils below me. A second passes before realizing it had moved to my fly. The additional length of line momentarily skewed my judgment. I focused, waiting for the line to come tight, which never did. Sliding further into the river not taking my eyes from where the fish showed, I cast again in hopes that a slower drift would entice a grab. My breaths held as the fly entered the zone. The line simply stops. All is motionless until the surface erupts below me as the hook solidly finds its mark. Behind me the fish breaks the surface, as fly line exits the rod in the opposite direction. There’s a power and weight there that I’ve yet to experience in days past. A second and third jump shows it’s a sizable buck. A hint of rose can be seen along his gill plate and flank. After the aerial assault he surges upstream as if unencumbered. By the time I’m ready to land him, Collin’s beside me, cradle in hand. We share in the special moment together as the buck slides into the net. The barbless fly easily comes from the corner of the buck’s mouth. 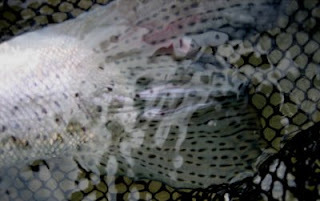 I’d hoped to hold onto the steelhead for a moment before it continued on the journey, but our reunion would be brief. He had other things on his mind. I tried to visualize his character; color, spots, scars, bulk and the power of the creature that rested in my hands, before he disappeared into the depths knowing this could be my last fish. Even though this one bears special significance, I treat them all in this manner. With one power beat of its broad tail he slides away. Content with my fortunes I settled on the bank to watch Collin wander slowly up to finish his piece of water. It didn’t take him long to hook up. I amble up the bank to return the favor. It’s another broad fish, but this time a hen still bright with sea lice clinging to her. As Collin prepared to send her on her way you could see his hand through the hen’s translucent tail. With the flick it, she too vanishes. This perfect pair would be the only steelhead we’d encounter during our brief time together. As their habitats erode and these fish continue to decline you wonder at what point you’ll embrace your last wild steelhead. 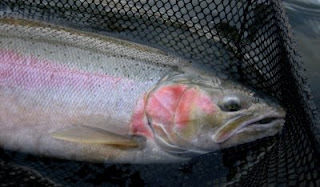 I recently heard Russell Chatham say that steelhead anglers have become complacent by equating the success of a day, a week or a year with as little as a single fish. By doing so we’ve accepted the doomed blight of this great fish. For those passionate about steelhead, I don’t think he could be further from the truth. With each fish, there is confirmation that they still travel the great liquid highways of their origins and avowal hope that future migrations will continue to exist. Without that connectivity, regardless of its frequency, all hope would be lost. Having just gotten back from my annual trip to British Columbia, I'm struggling getting back into work, home life, and just about everything else that isn't related to fishing for these mysterious fish. But, in reality such angst is something all of us who fish with a fly go through. I'm not alone, I know that. Most of my companions on this trip are suffering equally. Since returning they've spent a fair amount of time manipulating their lives to accommodate one last opportunity to hook up with one more steelhead. Should it be just a tug, a sign that they are still there, that would be enough. Just to fish their rivers would be sufficient. Since I'm having trouble writing anything worth reading, here's a few photo's from BC. It was a good year, better than usual.